I love digitization projects. They bring history, especially long out-of-print documents to all of us. The Memoirs of Henry Timberlake is one of these documents and it’s downloadable through the Internet Archive. Henry Timberlake (1730 – September 30, 1765) was a colonial Anglo-American officer, journalist, and cartographer. He was born in Virginia in 1730 and died in England. He is best known for his work as an emissary to the Overhill Cherokee during the 1760s. 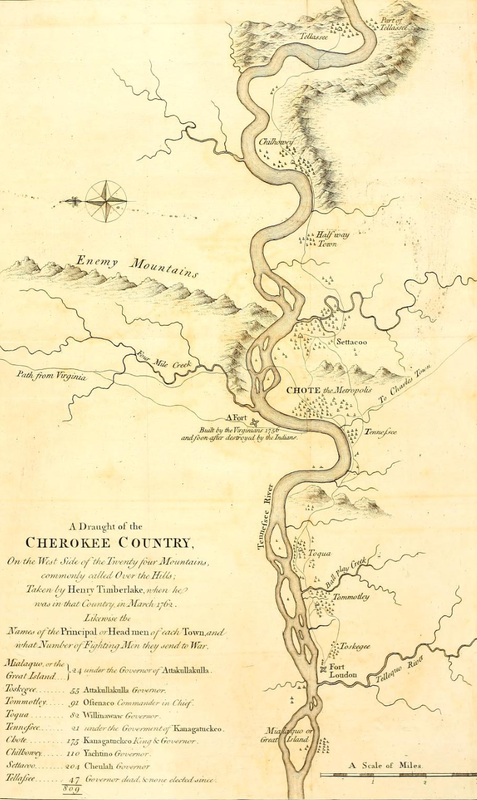 Timberlake’s account of his journeys to the Cherokee, published as his memoirs in 1765, became a primary source for later studies of their eighteenth-century culture. His detailed descriptions of Cherokee villages, townhouses, weapons, and tools have helped historians and anthropologists identify Cherokee structures and cultural objects uncovered at modern archaeological excavation sites throughout the southern Appalachian region. During the Tellico Archaeological Project, which included a series of salvage excavations conducted in the Little Tennessee River basin in the 1970s, archaeologists used Timberlake’s “Draught of the Cherokee Country” to help locate major Overhill village sites. The memoirs of Lieut. Henry Timberlake : (who accompanied the three Cherokee Indians to England in the year 1762) ; containing whatever he observed remarkable, or worthy of public notice, during his travels to and from that nation ; wherein the country, government, genius, and customs of the inhabitants, are authentically described ; also the principal occurrences during their residence in London ; illustrated with an accurate map of their Over-hill settlement, and a curious secret journal, taken by the Indians out of the pocket of a Frenchman they had killed (1765). So here you go….download and enjoy. Hat tip to Min for finding this document. This entry was posted in Cherokee. Bookmark the permalink.